In a report according to yahoo more than 40 percent of Americans say Donald Trump should step dawn in the presidential race following the release of a video of the GOP nominee making lewd comments about women in 2005. The report said ABC News and SSRS, a survey research firm conducted a rapid response poll, asking whether Trump should withdraw as the Republican nominee for president. 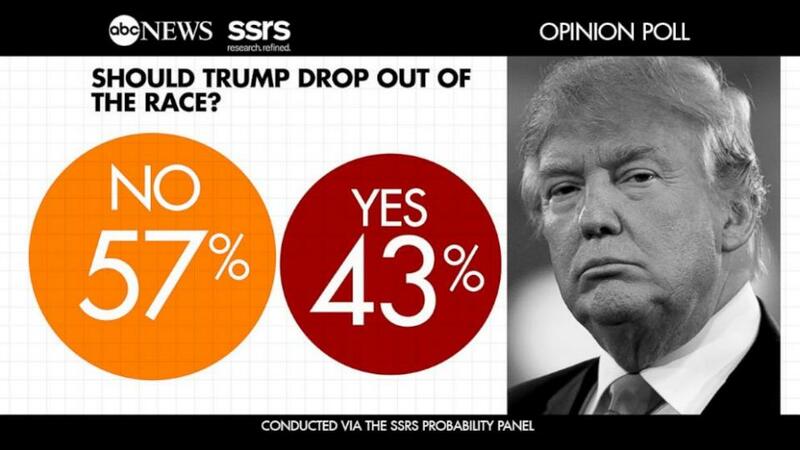 Forty-three percent said he should, while 57 percent said he should stay in the race. As to the effect of the video of Trump's vulgar comments on their vote, 53 percent said they are now less likely to cast a ballot for Trump, and 46 percent said the recording of the nominee's remarks will make no difference in their decision. Two percent said the video makes them more likely to vote for him. There was a stark gender gap, with 62 percent of women less likely to vote for him while 55 percent of men say it will make no difference on their vote. Prior to The Washington Post's release of the video on Friday afternoon, another ABC News/SSRS poll asked Americans how worried they would be for the future of the country depending on which candidate is elected president. Sixty percent said they are “very worried” about the country's future if Trump wins the presidency, significantly more than the 39 percent who said the same about the prospect of Democrat Hillary Clinton becoming president. Over 75 percent of Americans said they are "somewhat to very worried" about the country's future if Trump becomes president, compared to 60 percent who have that level of concern about Clinton winning the election. Also prior to the release of the video of Trump's lewd remarks, we asked respondents to give the first word that comes to mind when thinking about the two major-party presidential candidates. The top responses were “disgusted,” “disappointed,” and “scared.” This comes during an election when both candidates have received historically high unfavorable ratings in polls.